Too late to pray, prey! Two tails are better than one! Shout if you like my snout! What kind of a rattler are you? Water, water, where's the water? That was some good elephant! 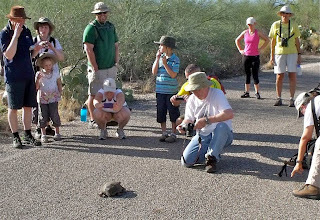 A fine Desert Tortoise being viewed and NOT being touched, picked up, or otherwise man-handled, due, I'm certain, to the watchful eye of skilled naturalists on the scene. (See Jean Hengesbaugh in the yellow shirt and white hat.) Remember this for the road: Move the tram, not the tortoise. If you pick up a tortoise, s/he will 'void bladder', that is: pee all over you. This is not just messy for you, it's potentially LIFE THREATENING to the tortoise. 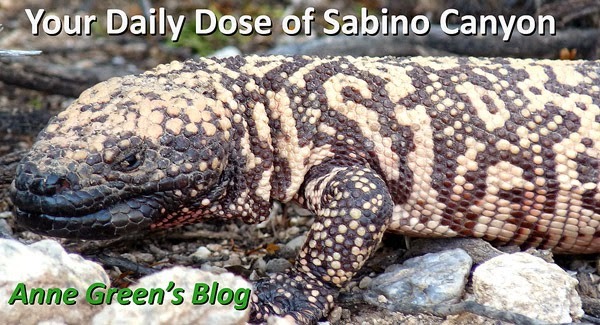 They store water for dry periods in their bladder. If they don't have direct and relatively immediate access to more water to tank up, they'll die. As I'm sure you are aware, it's still pretty dry in the canyon now (what with no creek flow). Even if it weren't, though, DO NOT pick up a desert tortoise, however noble your intentions. If you need to stop the tram (or other vehicles), do so. The tram drivers actually like to point out critters to the tourists. They'll stop for you AND wait for the tortoise to cross the road. 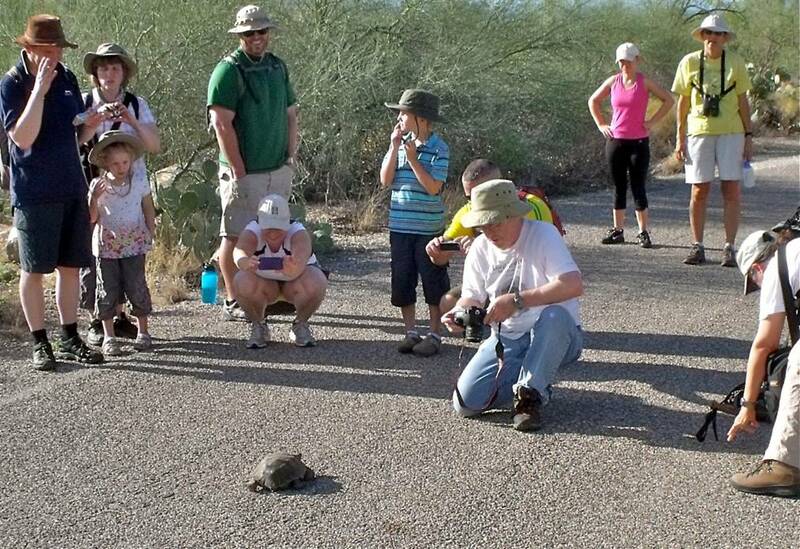 As a tram driver in the canyon.Yes we love it when people point out critters to us, and will most definitely wait for any critter to cross the road. They always have the right of way.